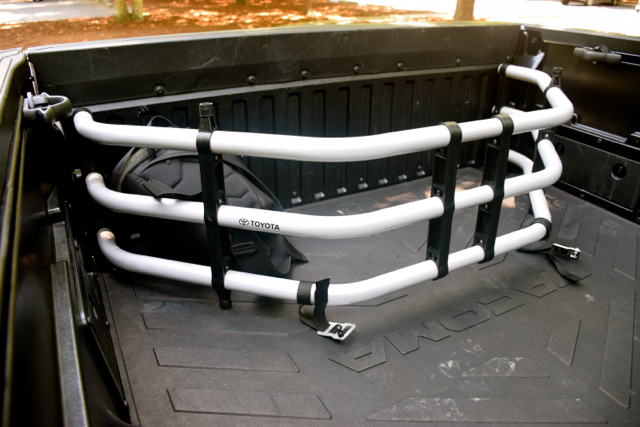 Return of the ultimate Tacoma pickup truck. 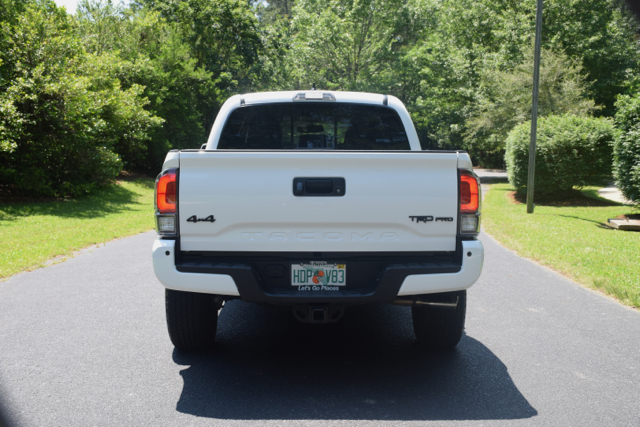 Upward bound: 2017 Toyota Tacoma TRD Pro. 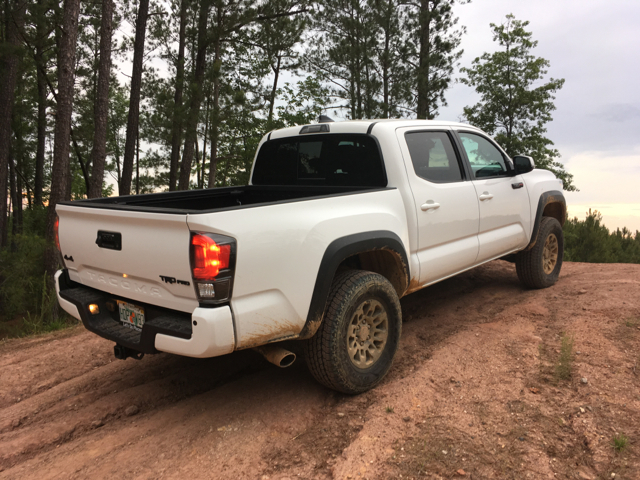 The third-generation Toyota Tacoma is the best one yet, although admittedly the footprint remains the same as before. 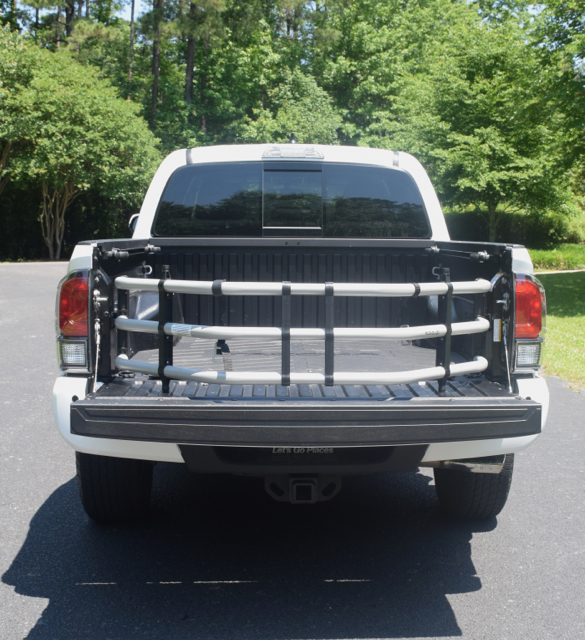 What’s different is the sheet metal and interior, along with new technologies, including available crawl control. 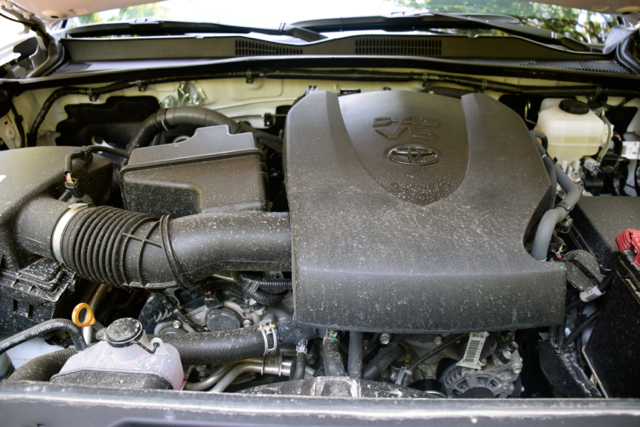 Toyota supplied a TRD Pro, a four-wheel drive (4WD) model with excellent off-road credentials, as a recent test model. 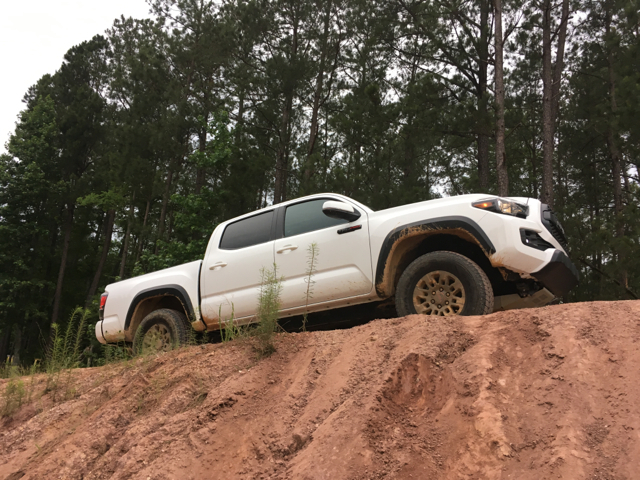 This wasn’t my first experience with a TRD — I’ve driven both the Sport and Off-Road grades. Indeed, in August 2015, Toyota hosted a media event near Tacoma, Washington, to showcase the all-new pickup. While there, journalists had ample opportunity to take the available 4WD models out on the roads and finally to the various off-road tracks and obstacles developed or set aside for our experience. You can find my report here. As before, the 2017 Tacoma is available in extended (Access) and Double Cab configurations. You have a choice of four-cylinder and V6 engine models and standard rear-wheel drive (2WD) and available four-wheel drive (4WD). Six grades are available: SR, SR5, TRD Sport, TRD Off-Road, Limited and TRD Pro. FYI, the TRD stands for “Toyota Racing Development,” now comprising precisely half of all Tacoma grades. 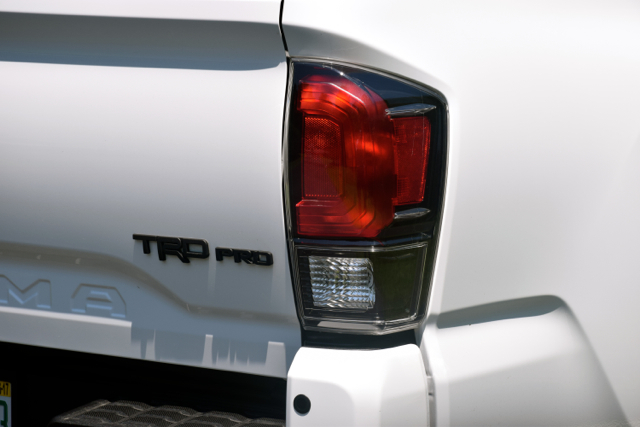 For 2017, the TRD Pro is new — it was not offered for the 2016 model year, although it made a brief appearance late in the second-generation Tacoma’s history. 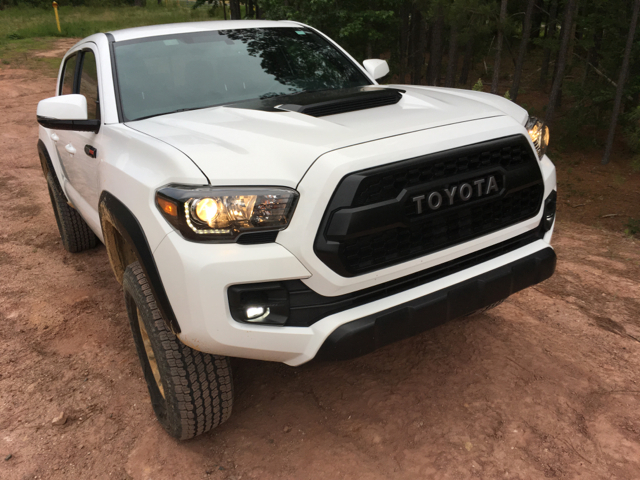 Consider this the ultimate Tacoma, a vehicle based on the off-road racers that have long defined the brand. Once again, the TRD Pro covers three Toyota models — Tacoma, Tundra, and 4Runner. 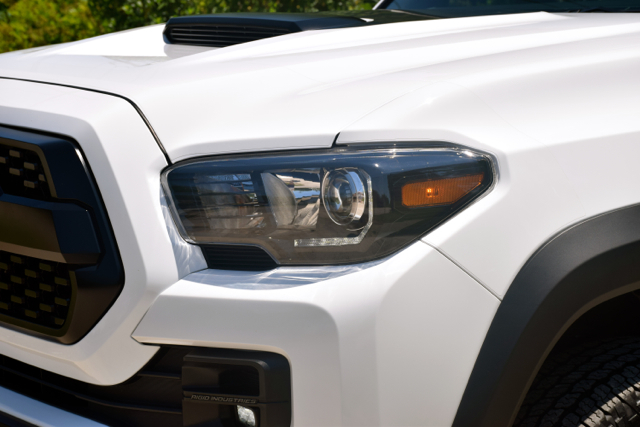 The TRD Pro offers a distinctive look with its heritage-inspired “TOYOTA” front grille replacing the usual Toyota symbol. That’s a look common to the now discontinued FJ Cruiser, itself a heritage model. 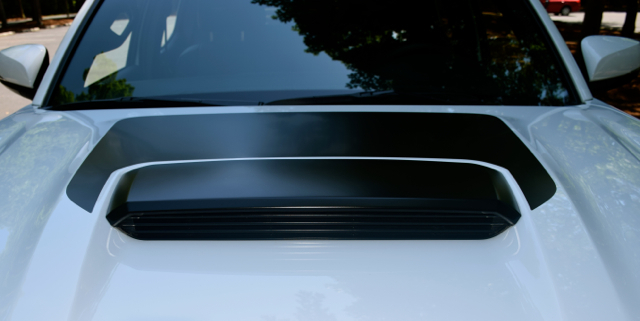 You’ll also find a blacked-out hood scoop and graphic; power side mirrors with turn signal indicators; black over fenders; and color-keyed grille surround, door handles, and rear bumper. Just three color choices are available: White, Cement, and Barcelona Red Metallic. My test model was white. But the fun doesn’t stop there. The TRD Pro features 16-inch TRD black alloy wheels set within Goodyear Wrangler all-terrain tires. 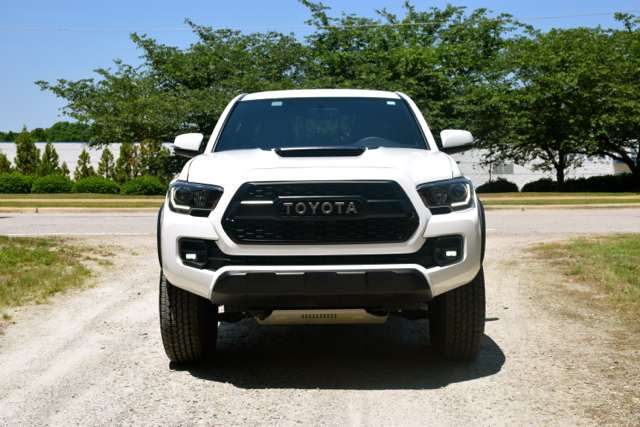 You’ll also find a TRD Pro aluminum skid plate, TRD-tuned front springs with a one-inch lift, a TRD-tuned rear suspension with progressive-rate off-road leaf springs, projector beam headlights, Rigid Industries LED fog lights, and TRD Pro badging and trim embellishments. Included is a standard V6 tow package. 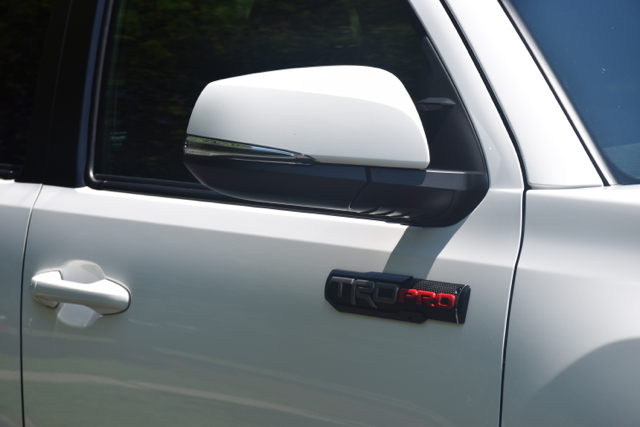 The TRD Pro is a Double Cab-only model. That’s good news for anyone who wants to squeeze in a few extra folk in the back seat. Space back there is tight, but three can fit in a pinch. Just don’t look for generous leg room as you won’t find it. Three adults sitting side by side is a challenge too, so go with two. 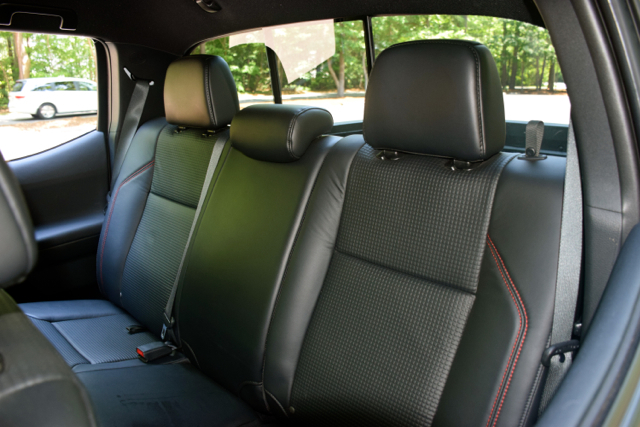 Up front is where it’s at — there is plenty of room for the driver and passenger. Thus, it is doubtful that many people buy this truck for work crew or family. 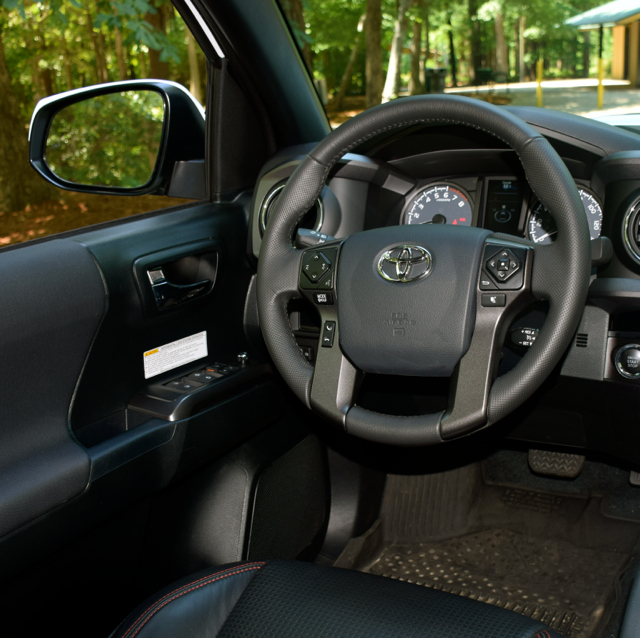 Instead, check out the full-size Toyota Tundra to meet those needs. 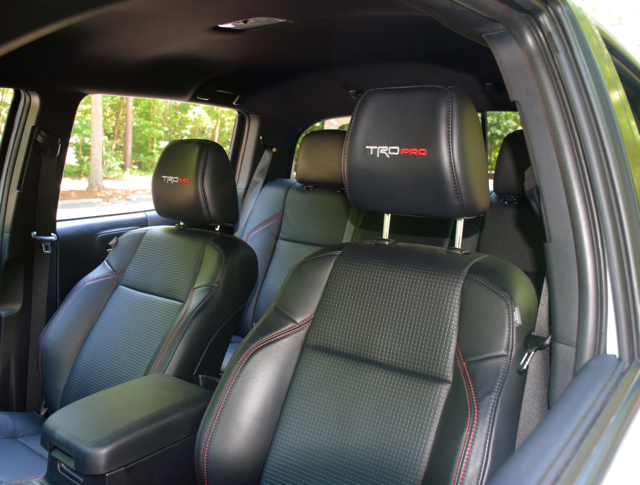 The TRD Pro features leather seats (with red double stitching). This may seem like a bit of a contradiction for people who love to off road, especially if you drag in dirt or clay from the outside. Every model comes with a tilt and telescopic steering column, full power accessories, a 6.1-inch touch-screen display, a six-speaker audio system with a CD player, USB outlets and audio jacks, Bluetooth, Siri Eyes Free, and a rearview camera. 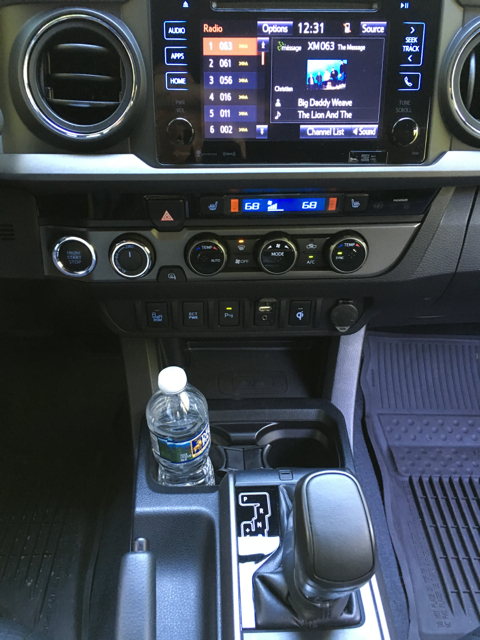 Also, you’ll find dual-zone climate control, a security system, four cup holders, and eight in-door drink holders. 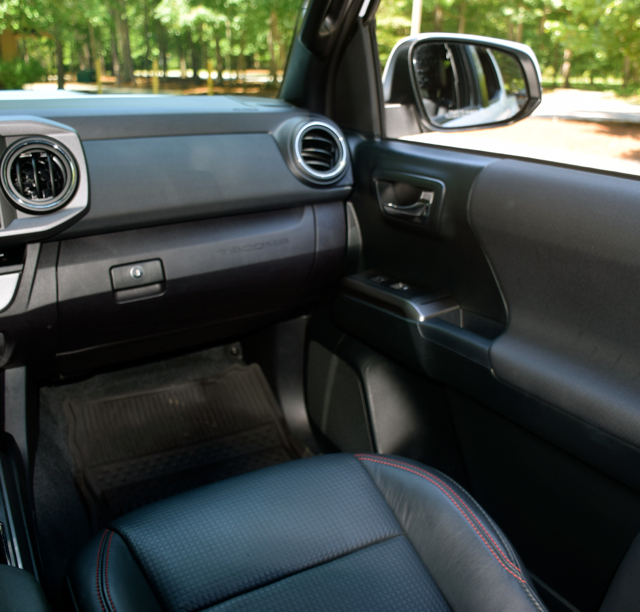 The glove box features a two-tier interior — ideal for organizing the owner’s manual and other important documents. A large, open compartment at the base of the stack is ideal for holding a smartphone and connecting to the USB port immediately above. Directly to the right of the ignition button is the drive controller. Naturally, it defaults to 2WD, but with a push of the switch, you’ll move to 4Hi or 4Lo. On top of the roof directly above the rear view mirror is the multi-terrain system (MTS) with crawl control. 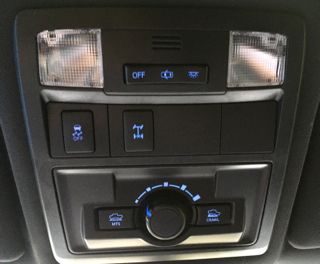 Here, you’ll want to shift into neutral, then choose 4L before pressing MTS and dialing in the terrain settings to control wheel spin, what effectively adjusts the engine throttle and braking. 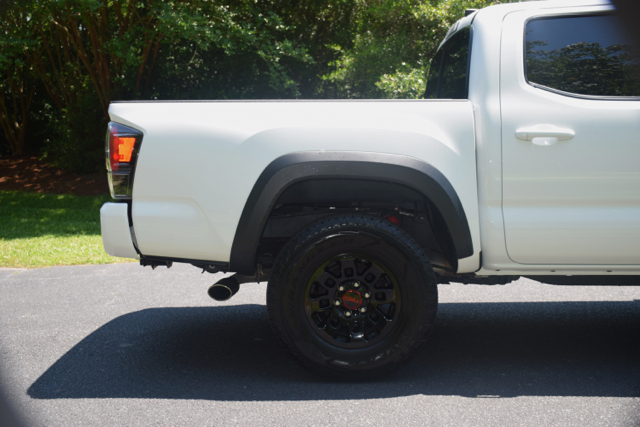 The Tacoma TRD Pro is a model that *wants* to go off road. I say this because its on-road manners are very much truck-like — “Taco” seems heavy, it picks up speed deliberately, and it has a wide turning radius. These are the reasons why some people prefer car-based utility vehicles, exchanging off-road prowess for occasional light-duty travel on graveled roads or across the grass. As for the TRD Pro, you’ll want to take this beast off road as soon as you can. 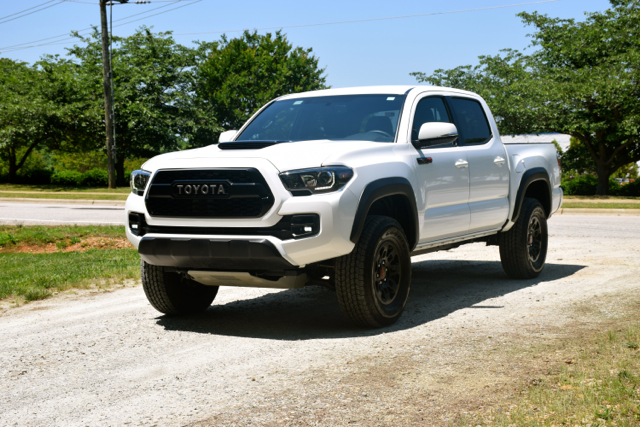 This model delivers the best approach (35 degrees), break over (23.9), and departure (26) angles of any Tacoma, providing a much-desired edge for devotees. In my area, there are a few places to take your off-roader without breaking the law. That said, my first off-road adventure involved a mud hole on unmarked property. Once done, I headed back to the main road, where an approaching state trooper signaled me to stop. I rolled down my window, explaining we just turned around and were heading back to the main road (that was the truth, once we exited the mud). Fortuitously, my explanation satisfied the trooper. Perhaps having my wife riding shotgun demonstrated we were simply an ordinary couple out for a Sunday afternoon drive. We just happened upon a slough of mud. But I was far from satisfied with that first experience, as it gave me little chance to use crawl control. Happily, my second voyage involved traveling for miles on clay and loose rock trails, where it seemed few people ventured and there was little chance I would get stuck or flagged down my police. The prized feature, however, wasn’t the trails. Instead, it was a beautifully formed heap of clay with a steep incline, what encouraged a thorough testing of crawl control. Once engaged, I released my foot off the gas and brake pedals, allowing Taco to climb the hill with little steering involvement. It is on these steepest inclines where the mechanical clanking of crawl control is most noticeable. Slowly, but steadily she climbed before reaching the top, which was only about eight feet high. I stopped the truck, got out, inspected the slope on the other side and decided *not* to attempt a forward descent. It turns out the front of the hill was so worn down that the angle was steeper than what I preferred to risk taking. Thoughts of ripping off a section of the grille or damaging the underside went through my mind, even when operated within the safe parameters of crawl control. Instead, I kept crawl control active as I moved the transmission into reverse and began backing down the hill. That was actually quite a fun experience — the truck gradually moved backward, alternating between crawling and braking, but mostly braking. At 2-3 mph it certainly was a slow crawl, but a well-managed one at that. Once done, I continued my off-road romp, switching from 4Lo to 4Hi, reversing the process. Here, you need to stop and allow the process to complete before moving on. Of course, Toyota supplied me with a top-grade 4WD model costing nearly $45,000. 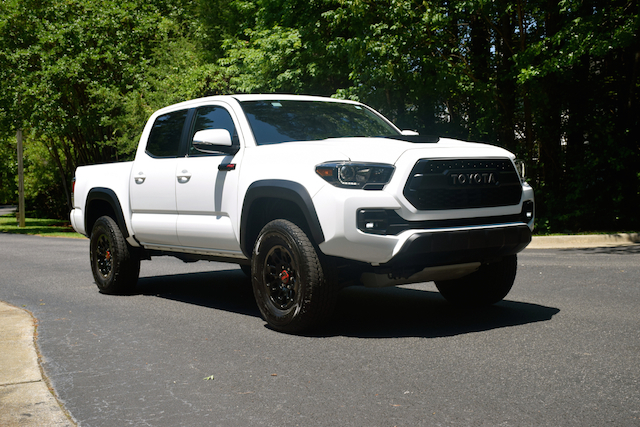 Toyota added a few options, including a bed extender ($300), bed mat ($120), all-weather floor liners ($209), paint protection film ($395), and a TRD air filter ($90). Of the five, the bed extender may be the most useful. In case you think the Tacoma is beyond your reach, the base 2WD S model retails for $24,320. The lowest cost 4WD is the SR Access Cab with a five-speed manual transmission ($25,845). Add $1,550 for the automatic transmission. You’re still looking at a four-cylinder engine, however. 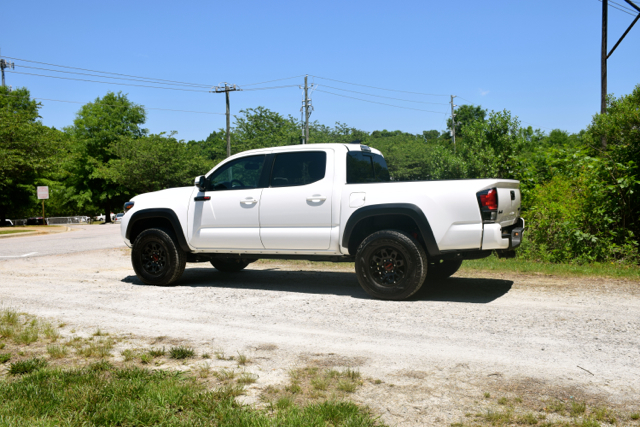 If you have four-wheeling and a V6 in mind, then start your look with a TRD Sport Access Cab and the automatic transmission ($33,970). The Double Cab will cost you $935 more. 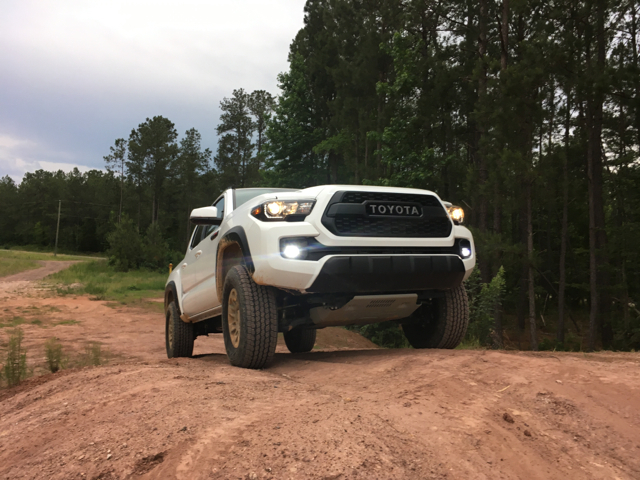 To get such helpful features as a locking rear differential, hill start assist control, and crawl control, you’re looking at the TRD Off-Road starting around $35,000. Opt for the Double Cab and you’ll pay $36,000. And that’s before choosing such off-road embellishments as all-terrain tires. Of course, some may find crawl control too gimmicky to justify the cost. I fully understand that argument. What it doesn’t change is that Taco maintains its credibility and market leadership in a strengthening segment. These two factors alone are main appeals with crawl control, a locking rear differential, and a GoPro mount serving as nice-to-have features.